St. James Memorial Church works collaboratively with many local and global programs to support those in need of love, hope, and encouragement by providing whatever we can. Outreach project for Lent. This year we are supporting the Episcopal Migration Ministries. Last year EMM helped the resettle 3187 refugees in 34 countries. They work with 30 different affiliate organizations in 26 dioceses. They also help develop language and employment skills to help refugees find a job and support their families. The St. Brigid’s Food Pantry is an outreach ministry of St. James’ Church, Long Branch. Each month the pantry serves over 2,000 members of the community. In addition to a fully stocked food pantry, it also provides financial assistance to help with evictions, utility shut-offs, and prescription purchases for less fortunate brothers and sisters in the North East area. A popular outreach project is the annual Christmas Giving Tree program. During the Advent season, St. James members commit to providing Christmas gifts for local children or a needy family who would otherwise do without. 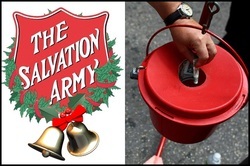 St. James Brotherhood of St. Andrew members volunteer in the Red Kettle Christmas Campaign. This famous Salvation Army program provides food, toys and clothing to over 6 million people during the Christmas season and helps more than 34 million Americans recovering from all kinds of personal disasters nationwide.